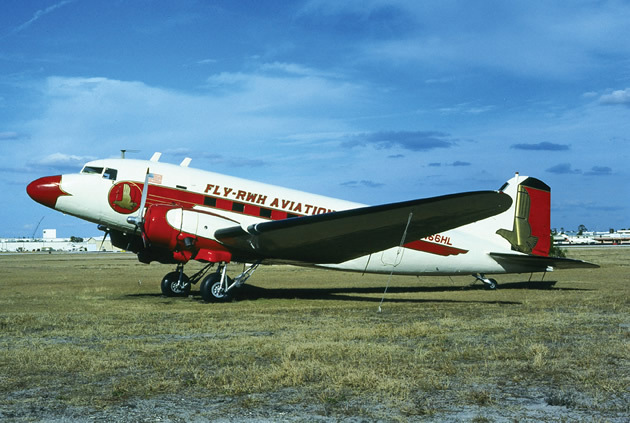 The DC-3 was a twin-engine metal monoplane, developed as a larger, improved 14 bed sleeper version of the Douglas DC-2. It had many exceptional qualities compared to previous aircraft. It was fast, had a good range and could operate from short runways. Its construction was all-metal. It was reliable, easy to maintain and carried passengers in greater comfort. Before the war it pioneered many air travel routes. It was able to cross the continental United States, making transcontinental flights and worldwide flights possible, and is considered to be the first airliner that could make money by carrying passengers alone. Civil DC-3 production ended in 1942 with 607 aircraft being produced. However, together with its military derivative, the C-47 Skytrain (designated the Dakota in RAF Service), and with Russian and Japanese-built versions, over 16,000 were built. Following the Second World War, the airliner market was flooded with surplus C-47s and other transport aircraft and attempts to produce an upgraded super DC-3 were a failure. While the DC-3 was soon made redundant on main routes by more advanced types such as the Douglas DC-6 and Lockheed Constellation, the design continued to prove exceptionally adaptable and useful. Large numbers continue to see service in a wide variety of niche roles well into the 21st century. Approximately 400 DC-3s and converted C-47s are still flying to this day as a testament to the durability of the design, many examples being over 70 years old.